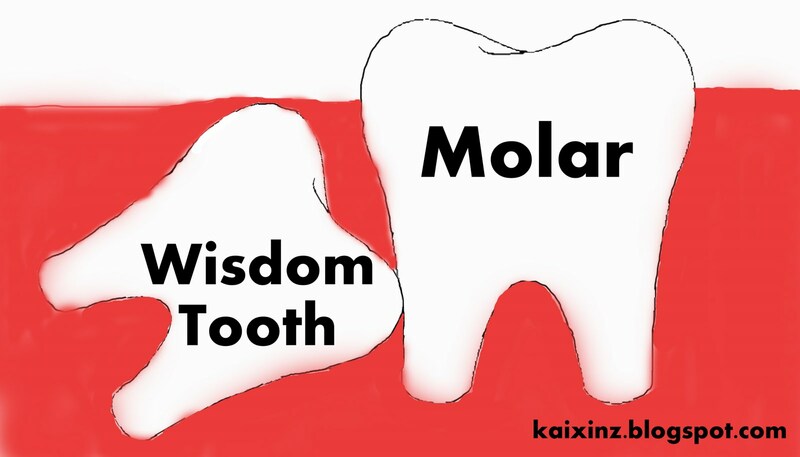 KaiXinz's: Losing my Wisdom Tooth! Yes, I'm 13 and I have a wisdom tooth. I think I just broke the record of the dentist's patients as one of the youngest people with wisdom tooth. Here's what happened. *Took pictures and videos but can't post them due to some Ministry of Health rule. For a few weeks or maybe a month or so, I've been feeling pain on my gum, and I can't really close my mouth properly. I told my parents about it, and they told me that I'm not drinking enough water, etc.. but just a week ago, I realized that one of my tooth is shaking. I figured it wasn't as simple as 'not drinking enough water' and besides, I felt pain. And then I remembered that there is something called wisdom tooth. I know that 13 is a really young age to have a wisdom tooth, but I also know that I grow up faster than everyone else. There is such a possibility. So on Monday, 21 November 2011, I went to the dentist for a check-up. The dentist could not find anything, so I asked if it's wisdom tooth. He said that I'll have to take an X-ray which costs around SGD60+! I took it anyway. I mean like, whatever it is, it's causing me pain, so I obviously have to check what it is. Dentist: How old are you? Dentist: Oh.. Frankly speaking, 13 is a really young age for a wisdom tooth to appear. It normally appears when you're around 17+++. But there is a possibility that you have a wisdom tooth. The other day I had someone who's 15 years old and have a wisdom tooth. Me: Wah seh, if I really have wisdom tooth then I must be his youngest patient. Oh. Dentist: So, before the X-ray, I need to ask you a question, it's my responsibility to ask you. Are you pregnant? Dentist: Oh, okay. I had to ask you to play safe. The other day I had this 14 year old patient who told me that she's pregnant! Dentist: HAHAHAHA!! Ok, come with me to the X-ray room. Now, if any teenager tell him that they have a wisdom tooth, he would tell them about me instead of that 15 year old person. HAHAHAH. Okay, I didn't manage to take a photo of the X-ray, so I'll draw it out. Basically my wisdom tooth is pressing my molar from underneath that's why I feel pain, and it's like that on both sides.. so, I needed to have it removed. I had piano lesson that day, so my dad asked me to go for the surgery on Tuesday instead. So, on 22 November 2011, 10.05, I went in and got the injection that's supposed to make me feel nothing. He injected 3 on my left and 2 on my right. Funny thing was, my right side was completely numb whereas there was no difference on my left. IT'S SUPER PAINFUL LA. I WAS GRIPPING ONTO THE HANDLES SO HARD SO THAT I WON'T HIT THE DENTIST LOR!!!! I felt NOTHING on my right side but for my left, it was like..WALAN EH!!!! Tears were running down my cheeks and when he was plucking my left side, I wanted so much to tell him that there was no numbness there, that the injection miraculously didn't work. But he had already started opening my gums to extract the wisdom tooth, I figured that he couldn't just leave it open while he inject another one. At that point of time, i regretted so much for not telling him earlier. I was crying and screaming silently to myself, "God! Please! Make it stop! Please! God!!!" i guess it would have been even more painful if I didn't scream for God. Thank God i'm Christian! Heheheh. And yes, they did cover my eyes but I could HEAR it. The drilling sound that my dad actually recorded -.- if anyone can find a web that can let me upload MUSIC ONLY let me know so that I can upload the recording. After the whole thing, I felt like the bravest girl in the whole world and I'm so proud of myself. I managed to go through it without giving up. I managed to bear with the pain without giving up. Losing my wisdom tooth was quite an experience for me. I never want to do it again. That's why I praying so hard that I won't have any problems with my top two wisdom tooth. Cause I'm only taking out the bottom two wisdom tooth. If I have to take the top two wisdom tooth out, I would make sure I feel nothing at all. I don't want to go through the pain again. BAD EXPERIENCE!!! Something to prepare my stomach for the pain-killer. But still, I'm the type of person that just wants to do it immediately. I don't want to spend a week thinking about it. Just do it now, the end, it's over. I won't have to think about it. I'll be taking the stiches out on this coming Tuesday, 29 November. And my face is getting a little swollen already. Praying so hard lor. And it doesn't really hurt anymore, so I can stop the painkiller. I feel like a total baby. I have to eat with teaspoon, cut the food into smaller pieces. After the surgery while waiting for the bus, I even drooled cause I couldn't control it. BUT I DIDN'T DROOL ANYMORE ALREADY K.